This house on West Patterson Avenue in Columbus might not look out of the ordinary, but it’s an important landmark. 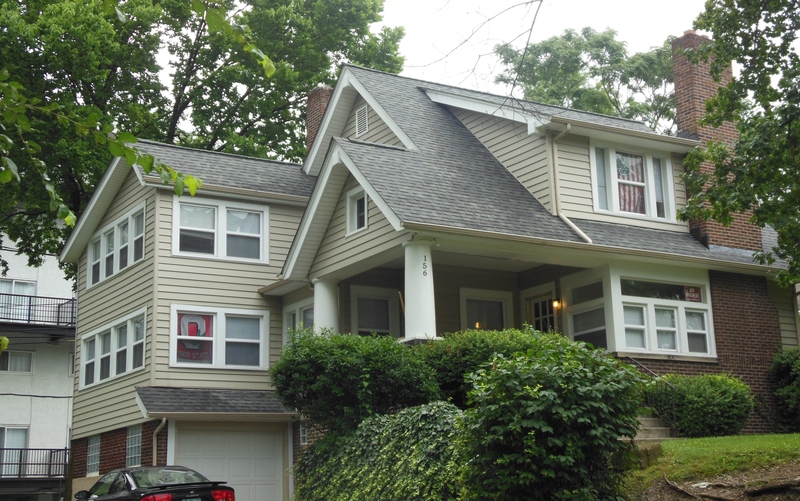 During the eight years that she lived here, Margaret Morse Nice (1883-1974) studied the daily activities and behavior of Song Sparrows who made her yard and neighborhood their home. Her detailed records of her observations were a major, history-making contribution to ornithology and the study of animal behavior. Watching birds was a pursuit Margaret brought with her to Columbus. When she was a girl, Margaret kept a diary of the birds she saw around her home in Amherst, Massachusetts. Mabel Osgood Wright’s Birdcraft, which she received for Christmas in 1895, was her favorite field guide. She also kept meticulous records of the family’s brown leghorn hens, noting the number of eggs the hens produced, as well as the “pecking order” that she used to describe relationships between the hens. Margaret’s talent in foreign language led her to graduate with a degree in French from Mount Holyoke in 1906. Then, her interest in nature prompted her to study biology at Clark University, where she observed wild Bobwhite quail. Her “Food of the Bob-white,” the first comprehensive study of the endangered bird’s diet that demonstrated how important Bobwhites are to agriculture, was published in The Journal of Economic Entomology in 1910. While at Clark, Margaret met fellow graduate student Leonard Blaine Nice, who grew up in Athens County, Ohio and graduated from Ohio University. They married in August 1909 and moved to Oklahoma in 1913. In their free time, the Nices traveled the state as volunteers for the Oklahoma Geological Survey, observing 361 species of birds that nested in or migrated through the state. This inspired them to co-author Birds of Oklahoma, published by the University of Oklahoma in 1924. Interpont was a prime habitat for wildlife, including Song Sparrows. Margaret was so fascinated by their behavior that she started watching them for several hours every day. Soon, she realized that a unique opportunity to study Song Sparrows was waiting at her doorstep. She baited a wire bird trap by her rose hedge so that she could observe them more closely. On March 26, 1928, she captured her first Song Sparrow, christened him “Uno” and started recording exactly what he did. As Margaret observed more of the abundant little brown birds, she banded their legs with colored celluloid rings so she could tell them apart. She also assigned a unique color and a field number to each bird. She mapped out their territories and memorized their variety of unique songs. In 1936, Blaine took a new job at the University of Chicago Medical School, so the Nices left Columbus for Chicago. The next year, Margaret published the first volume of Studies in the Life History of the Song Sparrow, the first book to document observations about a bird population in general, and Song Sparrows in particular. The book described the Song Sparrow’s environment on Interpont; its migration practices; its territorial behavior; relations between the sexes; nest-building, egg-laying and incubation; care of the young; and survival. Her friend Edward Thomas contributed three photographs to the book. In 1943, Margaret published the second volume of her study, which focused on the Song Sparrow’s behavior and song. Margaret wrote more than 250 journal articles, seven books and 3,313 reviews of other people’s work. 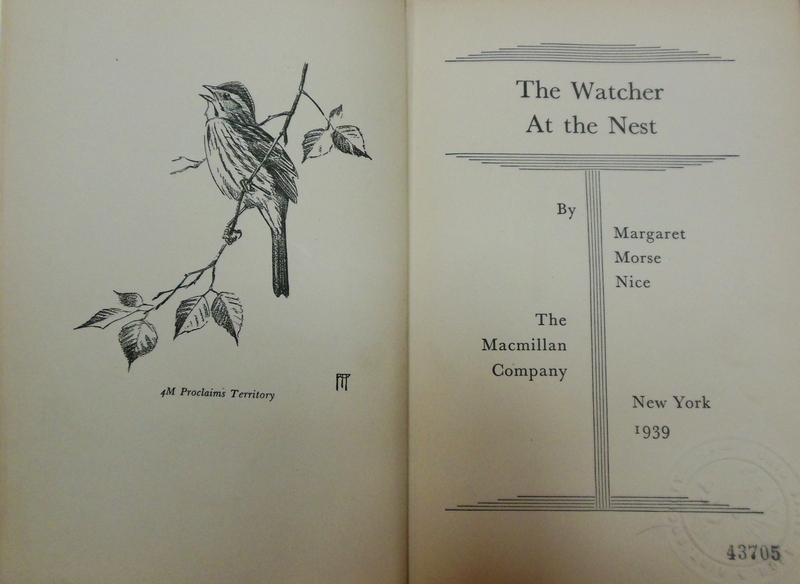 In The Watcher at the Nest, published in 1939, she told tales of her birding adventures, but also writes about how important it is to conserve wildlife habitats. Roger Tory Peterson, the noted ornithologist who created the Peterson Field Guides series, supplied the illustrations. Besides receiving honorary degrees and awards for her work, Margaret was also honored by having a Mexican species of Song Sparrow (Melospiza melodia niceae) named after her. To read more about Margaret Morse Nice, see her autobiography, Research Is a Passion with Me, published in 1979. Articles about her include “In Memoriam: Margaret Morse Nice,” by Milton B. Trautman, in the July 1977 issue of The Auk, and “Song Sparrows of Interpont: Margaret Morse Nice, Ornithologist,” by Carolyn V. Platt, in the September-October 2002 issue of the Ohio Historical Society’s TIMELINE. Bird Watching with Margaret Morse Nice, by Michael Elsohn Ross, and Julie Dunlap’s Birds in the Bushes: A Story about Margaret Morse Nice are biographies written for children. The Margaret Morse Nice Papers are housed in the Division of Rare and Manuscript Collections at Cornell University Library. The collection includes personal correspondence; manuscripts; subject files; items related to her articles, lectures and radio broadcasts on ornithology; photographs, notes and drawings; and printed material. This entry was posted in Birds, Books, Columbus, History, Special Collections. Bookmark the permalink.